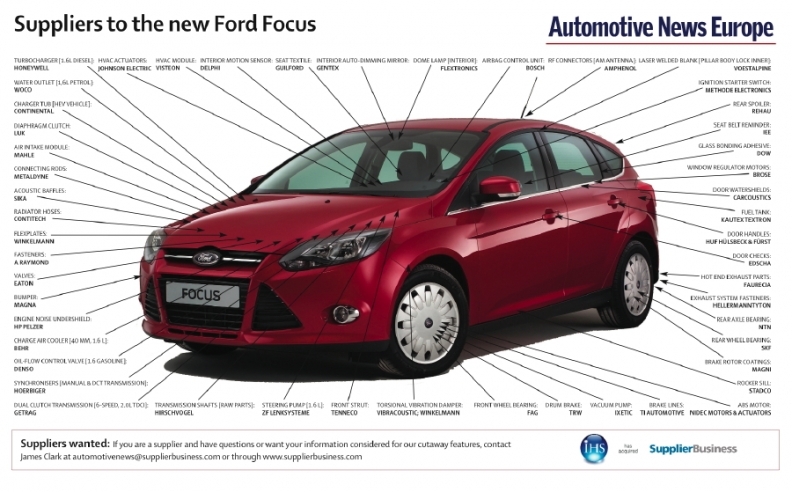 Some of the world’s leading suppliers contribute to the improved safety features in the new Ford Focus. Autoliv Inc. supplies the car’s passenger airbag, side airbags and seat belt system for the front seats. Robert Bosch GmbH supplies the airbag control unit, plus sensors, while the driver’s airbag module is supplied by TRW Automotive. The driver’s front airbag was designed to help reduce driver chest and rib injuries. TRW enhances chest protection through the use of a reconfigured curved-shaped tether that pulls in the lower section of the airbag to help reduce the impact of the airbag on the driver’s chest and ribs. Ford says the improvement is particularly beneficial to older drivers, who might suffer more severe injuries than younger occupants when hits by a deployed airbag. Stadco Saarlouis Ltd. & Co. KG supplies both the A- and B-pillars to the Focus. The B-pillar reinforcement, a key structural part, is made from ultra-high-strength Boron steel that is produced using an innovative so-called “tailor rolling” process. The process allows the thickness of the steel sheet to be varied along its length, so that the part has increased strength in the areas that are subjected to the greatest loads. The tailor rolled B-pillar has eight different gauges, ranging from 1.35mm to 2.70mm, and in addition to optimizing side-impact crash performance, the new design saves 1.4kg in weight per vehicle. Stadco supplies the B-pillar unit from its plant in Saarlouis, Germany, which is the same town where the Focus is built. German suppliers helped Ford to reduce CO2 emission 18 percent to 139 grams per kilometer in the new third-generation Ford Focus compared with the previous 2.0-liter model. Freudenberg Sealing Technologies cut the Focus’ emissions on the Focus with its so-called Low-Emission Sealing Solutions (LESS). The German supplier’s modern encoder technology provides the data needed to optimize the injection process and, therefore, the combustion process too. In addition to encoders and radial shaft seals for engines and transmissions, Freudenberg also supplies the compact car’s rubber-steel composite parts, valve stem seals, boots, O-rings, and shock absorber seals. The new Focus features electric power assisted steering, a standard that reduces CO2 emissions by approximately 3 percent compared with a traditional hydraulic steering system. ZF Lenksysteme GmbH supplies the steering pump to the system, while ThyssenKrupp AG provides the steering column. TRW Automotive supplies the Focus with its steering wheel base and switches.